NoveBluesky International is a non-governmental organization located 35 km from Kampala city along Hoima Road in Mpeggwe village. Our small school is focusing on improving the quality of life for people with special needs within the community. The special needs in focus are youth with mental disability, young single mothers, and children from low-income families. There are about 10 children from the local community attending the kindergarten section of the school. Bluesky also offers primary education to a small group of children with minor learning disabilities and special needs. For some students we offer scholarships for attaining secondary education. 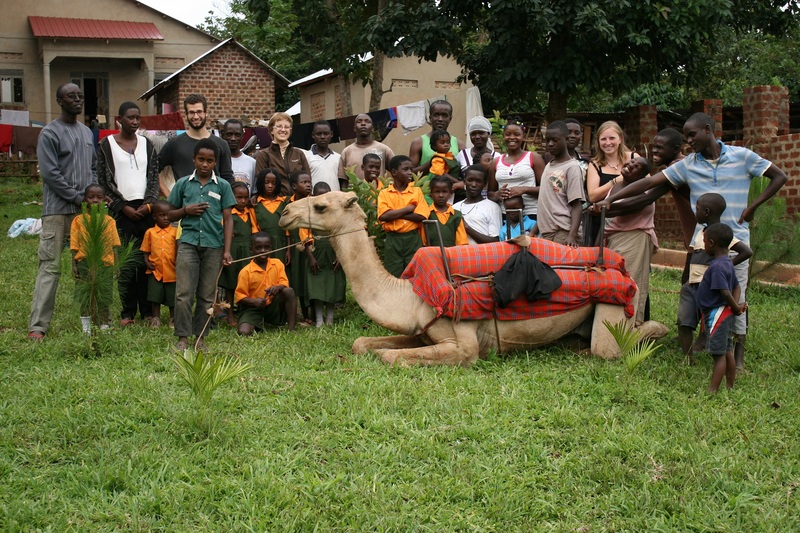 Students and volunteers with an exotic guest from the North. Only recently the self-support program of the school has been extended with co-funding from the Estonian NGO Mondo. Cottage Industry is a program of Bluesky with its main goal to provide employment for persons with special needs at Bluesky and to function as model-project to demonstrate to broader public that persons with special needs are able to work and participate in the society. Cottage industry involves a variety of small scale production units that emphasize production of items in view of the skills that the youth with special needs shall have acquired in the practical skills training program of Bluesky Education Centre. Examples of production units that will be included during the project are animal farming, crop farming, and crafts making. The products are partly used for self-support (e g providing food) but also sold and the income shall be used for the living costs of the involved youth. This gives the youth with special needs the opportunity to be productively participating in the society and support their living in Bluesky. Within the cottage industry the youth with special needs will be active in crop farming – growing maize, beans, irish potatoes, cabbages, tomatoes, cassava, eggplants; and animal farming – cow, pigs, ducks, hens, goats. They also learn how to pick and process the crops, and preparing their daily meals. The main meal of the day is lunch which usually contains posho and beans sauce. Students eat porridge (maize or millet flour) for breakfast.